For the 4th example we will not use a standard example from Visual Objects but will create a new sample app in Visual Objects to remote control Excel and to write data to an Excel Sheet. I found the following example in the Comp.Lang.Clipper.Visual-Objects newsgroup (which I changed a little bit for this example). •Create a new terminal application in Visual Objects and copy and paste the code below into the app. 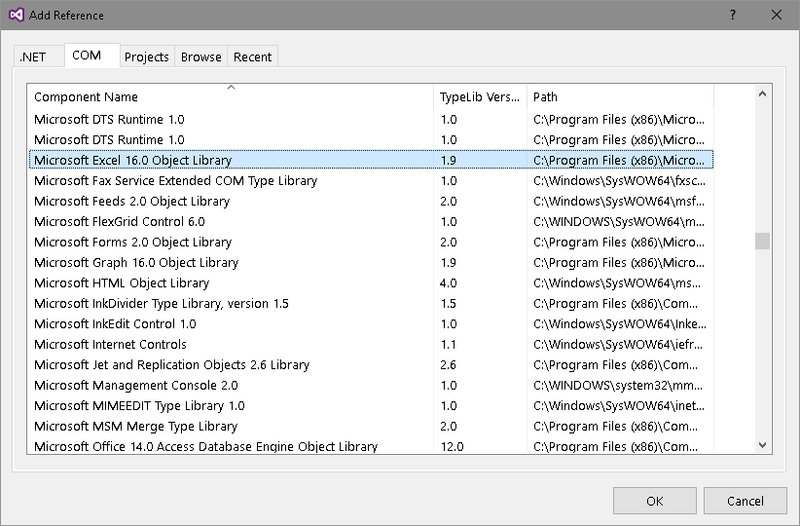 •Open the application Properties and add the Ole Library. •Also rename the app to "ExcelTest". •Now open the start module and copy the code. •Compile and run, and you will find an xls file in the C:\ExcelTest folder. •Export the AEF to "C:\ExcelTest\ExcelTest.AEF"
•Run the VOExporter and export the code. •Note that the name Range is now in front of the Square brackets. Range is a so called "Indexed property" of the worksheet. Visual Objects uses a "funny" syntax for this. X# uses the same syntax that most other languages do. The property looks like an array (the square brackets) . and remove the NIL return value from the RETURN statement. •Now 2 errors remain. These indicate that X# does not know how to convert the array index from string to int. This is on the line with the range assignment. The code above uses 'Late Binding', so the types are not known at compile time. X# does not know if the Range property from the Worksheet object is an indexed property or if it returns an array. It assumes that it returns an array and wants to specify the array index which is numeric (and subtract one because Visual Objects uses 1 based arrays where .Net uses 0 based arrays). •The best way to fix this is to use strong typing and use the Generated Class wrappers for Excel. •Right Click on "References" in the solution Explorer and Choose "Add Reference"
•Locate the "Microsoft Excel nn.m Object Library". On my machine that is Excel 16.0. •This will add an entry to your References list with the name "Microsoft.Office.Interop.Excel". This is a generated type library that contains class definitions for all types inside Excel. •Your code is now strongly typed, so you should also get intellisense if you try to select a member from one of these objects, such as oExcel:Workbooks. •Compile and run the code . It works as expected. •Now run the app again and everything works as expected. Application is the interface, ApplicationClass is the actual class that implements the Application interface. This is a model that you will see for most Automation Servers. Many people have asked for a way to implement OLE Events. With the X# code and the generated type library this is very easy. These are so called "Primary Interop Assemblies" (PIAs), pre-compiled assemblies, for different Excel versions. You can use these as well. These assemblies are installed with the Office Developers Tools for Visual Studio. On my machine they are located in subfolders of "c:\Program Files (x86)\Microsoft Visual Studio 14.0\Visual Studio Tools for Office\PIA" .